For this childfree couple, Disneyland isn’t the happiest place on earth. Cannon Beach is. Or at least the happiest place in the continental US when we need a quick weekend getaway. Of course our criteria are different than most. 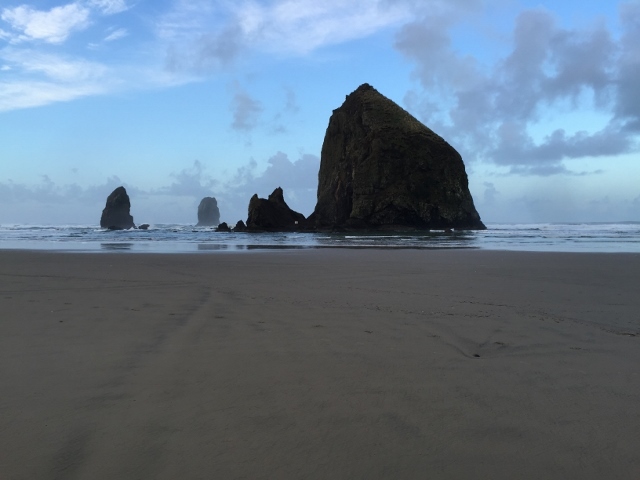 Cannon Beach, Oregon has nearly all of the things that make us content: ocean, sand, cozy lodging, slow pace, lots of dogs, and interesting dining options. As a beach town, it’s hoppin’ in the summer but this past December it was decidedly not, so it was a particularly nice time to visit. Another reason it gets our vote and our tourist dollars is because we’ve both been going to the Oregon Coast since we were wee tots, and that particular stretch of coastline holds a lot of fond memories. 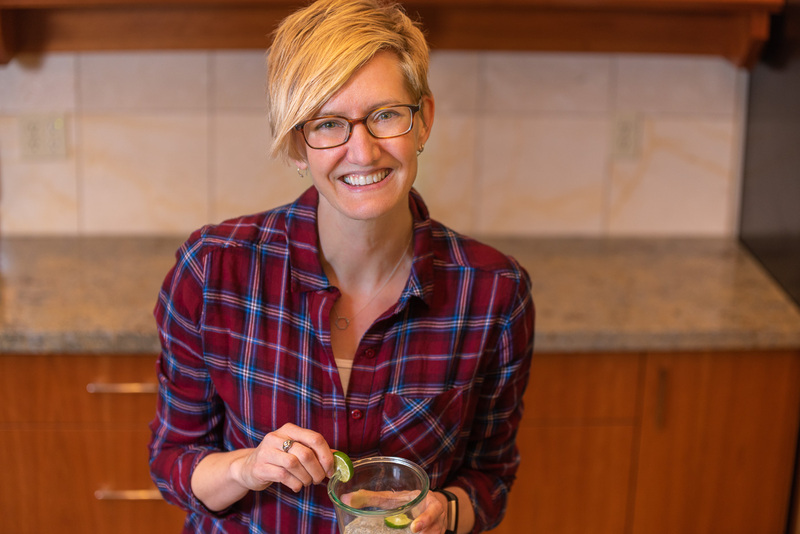 If you search for vegetarian restaurants in Cannon Beach online or ask a local business owner for a vegetarian restaurant recommendation, you’ll probably end up at Sweet Basil’s; be grateful. The atmosphere is relaxed, the booths looks like repurposed church pews, and the Mom and Pop behind the counter are welcoming. In fact, the menu is pretty darn welcoming too, especially for vegetarians, vegans, and the gluten-free crowd. I had several options to choose from but decided to start with the soup of the day: Cajun red bean. I asked in advance and was assured it wasn’t too spicy. The best part about this soup starter? My own little bag of oyster crackers!!! They floated, they soaked, and they made a good soup even better. I followed that up with the Zorba wrap, which tasted very fresh and had lots of color and satisfying crunch. (It can be made vegan without the feta.) As you can clearly see below, it was a huge portion so I could only eat half. On the side was a tiny cup of sweet and vinegary coleslaw. It was a departure from the standard creamy dressing and I loved it. 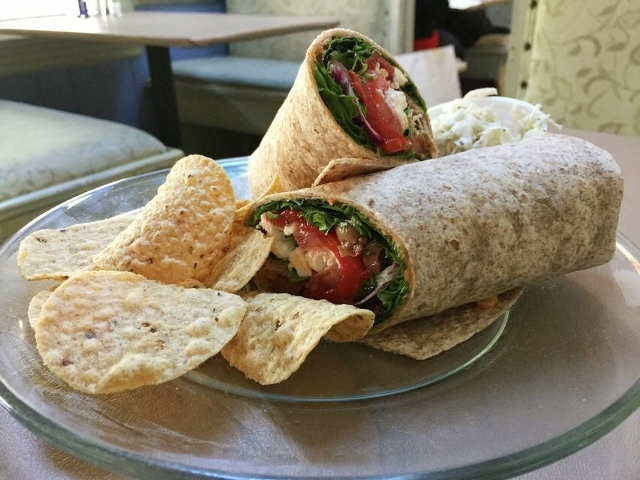 The Zorba: hummus, organic greens, tomatoes, roasted red peppers, feta cheese, and black olives, served in whole wheat wrap. I would say Sweet Basil’s would be the place to go if you’re in a group with vegetarians and non-vegetarians. They’ve got turkey, crab, and tuna too so everyone could likely find something to grub. Another thing your group might like? Homemade desserts. 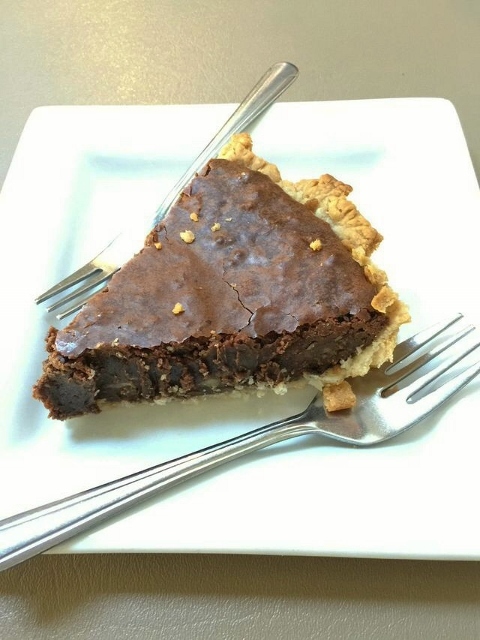 Though I was tempted by the vegan gluten-free coconut cake, I can attest to the otherworldliness of the chocolate pecan pie. For a pub with a tiny menu, we were pleasantly surprised by the number of vegetarian options at The Irish Table. 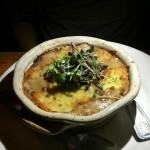 And this place totally wins for best ambiance: dark and rustic, as my food photos can attest. Soon after we were seated, they brought a beautiful pottery bowl full of Irish soda bread. The lighting was so dim I thought for sure it was banana bread, until I asked. From taste and appearance (and hope) my guess is that it might be made partially with whole grain flour. 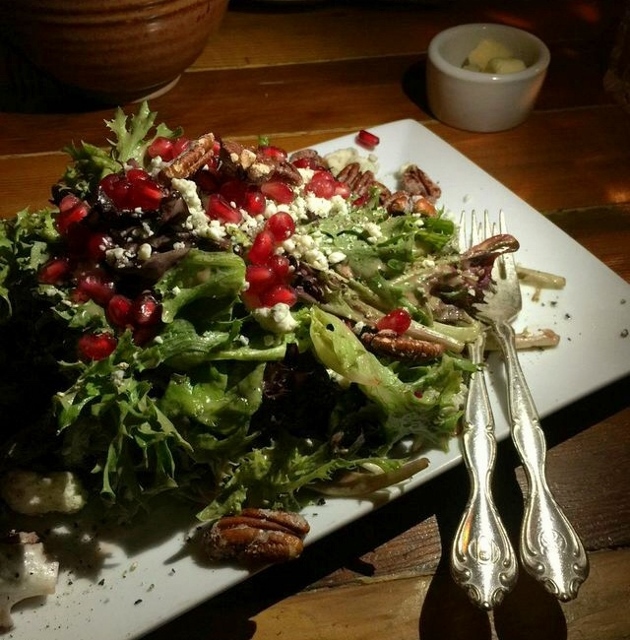 Next up was the pomegranate salad. Again, for a pub, I was quite impressed with the fancy presentation. The greens were nicely coated with a tangy dressing and piled high with pecans and gorgonzola. And let me tell you, they did not skimp on pomegranate arils. Instead of a traditional entrée I opted for the cheese board. It was filled with some unique crispy, crunchy, and creamy offerings. 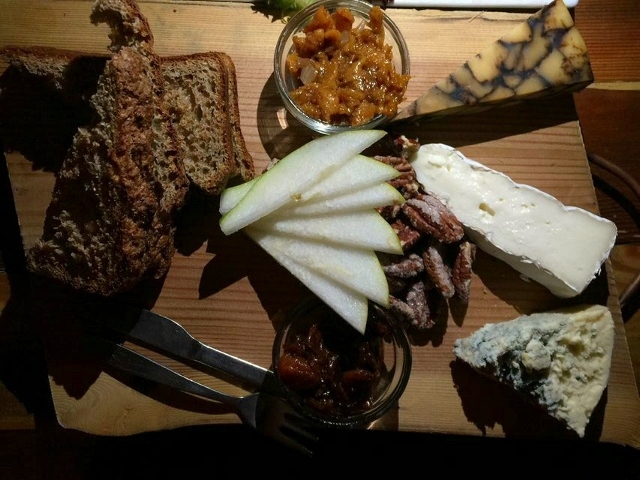 The standout was the sour cherry chutney, which shared space on the board with candied pecans, sliced pear, more soda bread, apricot chutney, and some extraordinary cheeses from Ireland and Washington: aged cheddar with porter, brie, and blue cheese. With my adorable tiny fork and knife, I put together endless combinations. Our fanciest and favorite meal during the trip was at the Bistro Restaurant and Bar. It might have had something to do with the gale force winds and pounding rain outside that made the warm intimate space all that more inviting. Let me first say that my picture does it absolutely no justice, but the best thing I put in my mouth in Cannon Beach was the Bistro’s roasted golden beet appetizer. The warm, perfectly cooked, thick beet rounds (Can beets be al dente?) 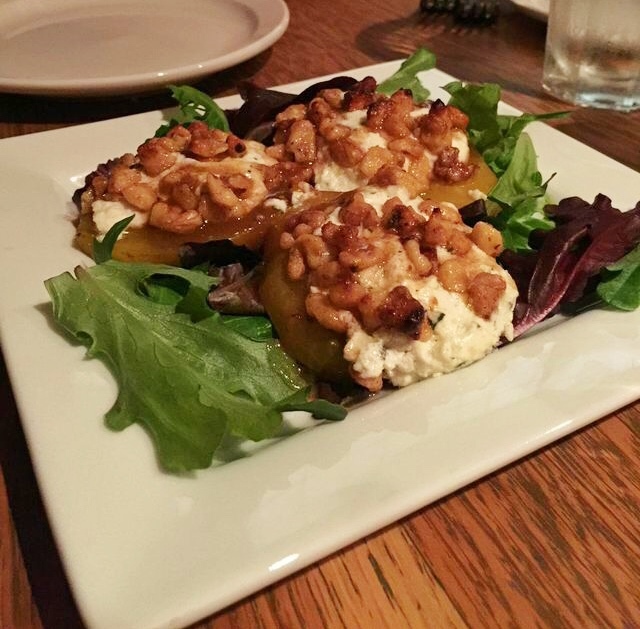 were topped with a blanket of herbed goat cheese and candied walnuts. In short, it was perfect. Each mouthful was salty, sweet, warm, and creamy. I ended up liking it better than my entrée, and my entrée was fabulous. My entrée was the linguini. 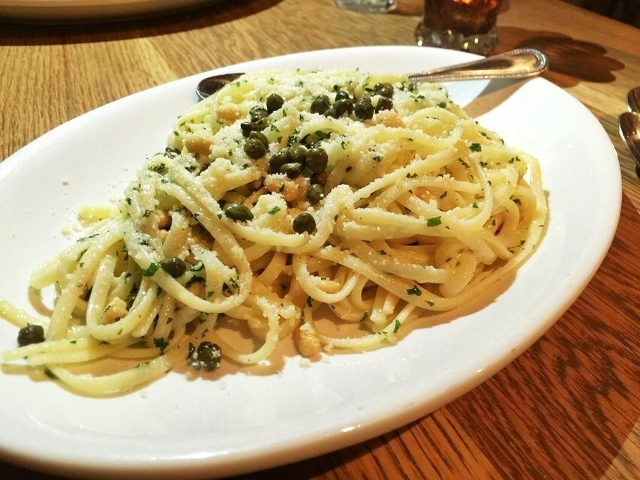 The golden buttery pasta had the bitter pickled flavor of capers and the crunch of pine nuts. With a light dusting of Parmesan, the flavors were nicely balanced. 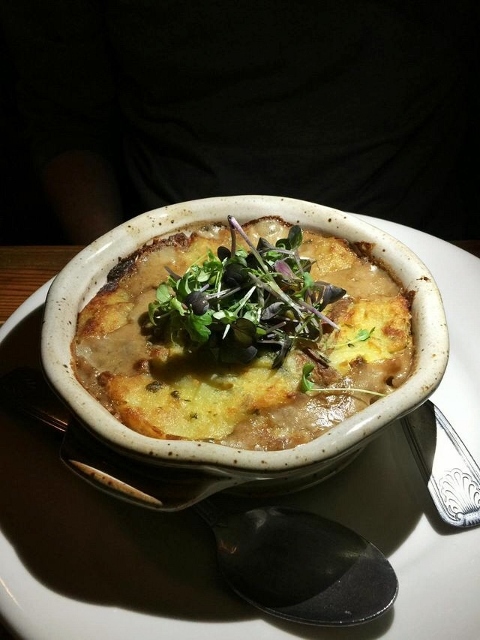 While we were exceedingly happy at Sweet Basil’s, The Irish Table, and the Bistro this time around, there are some other joints you might check out that we’ve had good luck with on past trips. The Lazy Susan Café: A bevy of brunch-style offerings like omelets, granola, and fried potatoes. I highly recommend the gingerbread waffle with lemon sauce and pears when it’s available. Bill’s Tavern and Brewhouse: Standard pub fare like (veggie) burgers and fries. My favorites are the hummus plate and the vegetarian burrito. Pizza a’ Fetta: In addition to great customer service, they’ve got unusual non-meat toppings (like fresh pineapple and walnuts) and homemade egg-free Caesar dressing. It’s always a dilemma, isn’t it? When you have the time and money to take a trip, should you return to your favorite spot or take a risk and venture to an unexplored land? As I’m getting older, I still feel the draw of experiencing new locations; I’ve got plenty of far away destinations languishing on my wish list. But for a short trip I find the familiarity and ease of a place like Cannon Beach to be incredibly relaxing, and nothing makes me happier. Do you have a favorite beach town that meets all your weekend getaway needs?